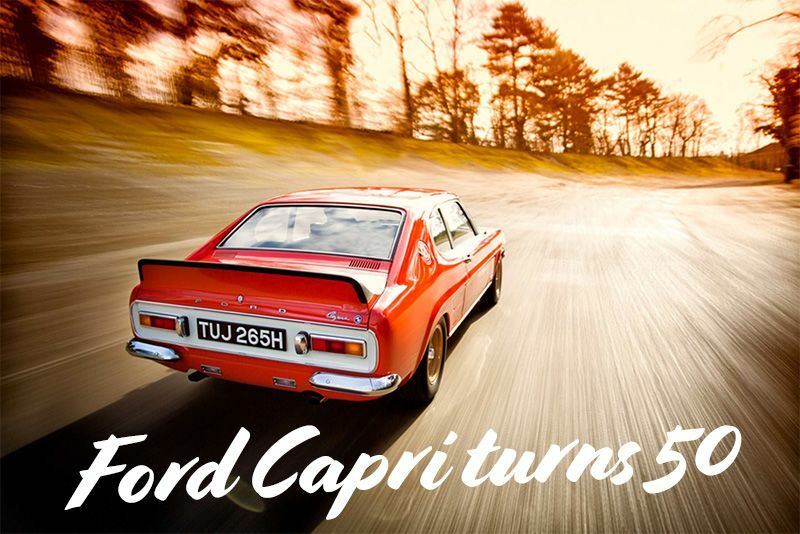 It's 2019 and the Ford Capri turns 50-years-old, in its heyday, the coupe captured the hearts of many, let's look back and reminisce. During the 60s, Ford wanted a sporty car for the working man of Europe, something to capture the hearts of the public the way the Mustang had in the U.S. What they achieved with the launch of the Ford Capri in 1969 was remarkable. The Capri was relatively cheap, could fit four inside, and was, for the time, quite fast. It nailed the brief on the head, going on to sell over 1,8 million units right into the 80s. The recipe was just right, offering a glimpse of the sporty coupe lifestyle offered by other sportscar manufacturers but at a fraction of the cost. In fact, they even marketed it as “the car you’ve always promised yourself,” and fans, to this day, agree... just ask its strong fanbase. So, what made the Capri such a success? Let's find out. In 1965, Ford divisions in Britain and Germany entered the design phase in collaboration, with the intention of attracting a younger, working-class audience to their new coupe. To keep costs down, the car would be developed on the Cortina MkII platform, but the designers had carte blanche and illustrated the model with a long bonnet and short tail to give it a sporty stance. By 1968, and after a £20 million investment into the project, the first car was ready and, to make sure there was a Capri on in every Ford showroom for its official release, a two-month production run commenced. It was during this time that Mitsubishi took Ford to court as the latter wanted to call their new coupe the Colt to align it with its American cousin, the Mustang. Ford lost the case and the Capri moniker was born. The launch happened at the 1969 Brussels Motor Show with two petrol engines, the 1.3-litre and 1.6-litre Kent's that produced 53bhp and 64bhp respectively. Mindful of costs, the Capri had a four-speed all-synchromesh gearbox, a leaf-sprung live axle and drum brakes at the rear, while MacPherson struts and disc brakes did service upfront. Eventually, Ford fitted a 93bhp 2.0-litre Essex V4 and the range-topping 138bhp 3.0-litre Essex V6, which saw the Capri clock speeds of over 100mph to the delight of the public. In 1974, Ford entered the MkI Capri into the European Touring Car Championship with its fastest iteration, the RS3100. To meet the ETCC homologation rules, Ford was required to build 1.000 road-legal coupe's for the race car to be eligible but, due to the 1973 oil crisis and waning consumer interest, they only made around 250 cars. Fifty years down the line and the Capri RS3100 is regarded as the best of the first-generation Capri's. It sported a de-tuned version of the race car’s 3.1-litre V6 engine, with 148bhp and around 250Nm of torque on tap. Other modifications included vented disc brakes, lower and stiffer suspension, a sports exhaust and a functional ducktail spoiler. Combined, these mods translated to better performance figures of 0-60mph in 7.3 seconds and a top speed of around 125mph. Shortly after the Capri RS3100 in 1974, Ford introduced the second generation coupe with revisions to make it a more practical day-to-day car. They shortened bonnet to give it more room inside the cabin, introduced the clamshell rear hatch and incorporated a foldable rear bench to make the boot more useable. The MkII also introduced a range of trim levels and specifications which appealed to a wider range of buyers. Clients could purchase a base-spec 1300L model with almost nothing to it besides an engine and seats, or choose the range-topping Ghia and, later, the “Midnight Capri” models that claimed a sporty steering wheel, different alloys and paintwork as their own. There were adjustments under the skin too, with softer suspension and larger disc brakes up front and Ford included a standard-fit alternator after issues arose with MkI’s dynamo type. Buyers of S-models and up could option an automatic gearbox and power-assisted steering while these same models received a new air-dam to maintain the Capri's sporty feel. The MkII dropped the RS3100's powerful 3.1-litre V6 and so the 3.0-litre Essex V6 prevailed at the top of the range. A 98bhp 2.0-litre straight-four Pinto engine replaced the 2.0-litre Essex V4 while the 1.3-litre and 1.6-litre Kent four-cylinders remained. After a four-year production run, the MkIII Capri was revealed but, due to a tight development budget of around £480,000, Ford's 'new' coupe was basically just a facelifted MkII. Updates were, confined to the redesigned quad-headlights, a pair of new wings, a new bonnet, fresh bumpers and updated paint and interior options. Known in-house as Project Carla, Ford's effort to reduce costs saw the Capri MkIII receive satin black painted versions of its predecessor's bumpers and, with a slight adjustment to the existing tooling machinery, they managed to create the MkIII's distinct “hooded” bonnet. Engine's too received no more than a modest update. To improve reliability, the 1.3-litre Kent engine got a new crossflow cylinder-head and reshaped cylinder bores, while the 3.0-litre Essex V6 received a redesigned intake. Emissions regulations by 1981 forced Ford to replace the 3.0-litre Essex V6 with the Granada's 2.8-litre fuel-injected V6, which wasn't a bad thing as it was more powerful, faster and refined than it's competition – the BMW 323i or Alfa Romeo Alfetta 2000 GTV. Time moves forward though and, in 1986, production of the Ford Capri came to a halt as the introduction of smaller, faster and more practical hot hatchbacks had prompted a decline in sales. It was the end of an era. Over the years, Ford has received numerous calls for the Capri to be revived. In 2010, they toyed with the idea of a Ford Focus-based three-door hatchback they could call the Capri as Volkswagen did with the Scirocco, but it never made it off the paper it was drawn on. Which is such a pity because the formula for a performance sports coupe for the blue-collar worker is just as enticing today as it was 50 years ago. In its 14-year production run, the Ford Capri found a generation of fans and, with its everyday-man demeanour, it's will be an icon for many more years to come.